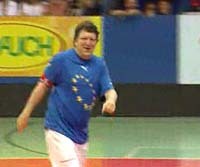 Something a little bit more light-hearted about the EU… In the margins of the resent EU-Latin America summit in Vienna, a special football match was staged: European Commission vs. Austrian Presidency of the EU. The Austrian broadcaster ORF has a 3 minute video of the ‘highlights’ of the match here. There are 3 things to note: firstly, the match ended as a draw (very diplomatic!). Second, the noise of the crowd is considerable – I wonder how they got the punters in for such a lousy match? Third, as far as I can tell, there are no women playing in the match – but what else would you expect from the Ãƒâ€“VP anyway? It’s worth a few minutes of your time to have a chuckle – Barroso’s belly (pictured) looks especially bad after all of those Brussels lunches. LabourList | Stand on the sidelines, or play the game?